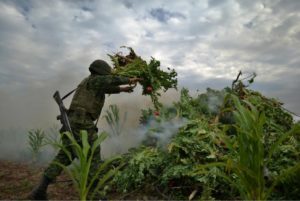 A Mexican soldier destroying opium poppies in Navalato, Sinaloa State. The New York Times. Fernando Brito. On July 16, 2015, Joaquin “El Chapo” Guzman, Mexican drug kingpin and leader of the Sinaloa cartel, escaped from federal prison in Mexico. He did so via a one-mile tunnel from beneath his private shower at the prison. The tunnel was equipped with a modified motorcycle that led to a half-built house overlooking both the prison and the nearby military base. Besides concerns about the effectiveness of one of Mexico’s most secure prisons, it leads me to wonder whether his capture in the first place was just an exercise in futility. Guzman’s penchant for tunnels extends past his daring prison escape. For decades, Sinaloa has been using tunnels to move drugs, people, money, and guns into the United States from Mexico. In Chicago, for example, roughly 80% of the drugs come from the Sinaloa cartel and Guzman’s capture did not shut off that tap. Art Bilek, a former Chicago detective with six decades on the job, states it well: “At this point [drug trafficking is] so well-established, it’s part of the culture.” This is a problem. Our current tactics are clearly not working. The war on drugs needs to be updated. The war is so outdated, that at a recent International Law and Drug Policy Reform session in Washington, D.C., the current drug conventions were called “Jurassic” in nature compared to other international treaty regimes. This framework will hopefully be handled and updated next year at a United Nations General Assembly Special Session on drugs. In the United States there has been some move towards drug reform as marijuana is the talk of the town. Still listed by the Drug Enforcement Agency as a Schedule I narcotic under the Controlled Substances Act, marijuana is prohibited under federal law. Other members of the Schedule I family include heroin, lysergic acid diethylamide (LSD), and methylenedioxymethamphetamine (ecstasy). However, 23 states have legalized marijuana in a medical form and four of those have legalized it for recreational use. Why would any state condone the use by its citizens of a member of that dangerous Schedule I grouping? That leads us back to the severely outdated drug laws that the US and many other countries still have in use. Steps are being taken on the federal level to resolve these outdated laws. For the most part, the Department of Justice looks the other way for patients in those 23 states who use medical marijuana. However, if U.S. Senators Rand Paul, Kirsten Gillibrand, and Cory Booker have their way, state medical marijuana programs would be legalized under federal law under the recently proposed “Compassionate Access, Research Expansion and Respect States Act”. Additionally, under the Act, marijuana would be reclassified as a Schedule II drug, grouping it with regulated drugs such as Vicodin, OxyContin, and Adderall. While this will not eliminate people like Guzman and the Sinaloa cartel, it may be a small step towards accomplishing the goals that the long ago proponents of the “War on Drugs” had in mind.